Welcome to my world. With budgets getting tighter every day, builders are looking for ways to cut costs but still increase sales. One way to do this is by renovating and recycling model home furniture and accessories they already have. This makes a lot of sense, but when employees or decorators are used for this task that don't understand merchandising, there's a good chance you won't get the desired results. Youngs Homes in Hobbs, NM asked me to come down and help them with their model home center a few years ago and had the right results - sales and traffic increased without it costing them a fortune. Since then they have brought in some new models, and realized it was time to look at re-modeling what they had. Employees had helped where they could to decorate the new models, but they just weren't getting the desired results. The Home Idea Factory was given the task of creating some Lifestylist Designed models using only the furniture that they already owned to keep costs down, but we did add some "personality packages" of artwork and accessories to add the lifestyle that was missing and keeping buyers from becoming emotionally involved with the homes. I'm going to share a few examples of what we accomplished in the next few weeks, but this will give you an idea of the results. This beautiful Champion Home has everything a buyer could wish for - 9 ft. ceilings, transom windows, a fireplace, and a dream kitchen with stainless appliances and vent hood, and an island. From the inside and out, people would never guess this is a factory built home. As a matter of fact, it offers more options and upgrades than most site built homes do! The family room had a rock fireplace, and they even showed a front bedroom as a study. The house had furniture in it, but needed some lifestyle added to it. By raiding the warehouse (notice the gold parsons chairs in the warehouse photo) we were able to pull the colors together more and add warmth to the home. Artwork and accessories highlighted the buyer profile for the area - ranchers - and furniture was re-arranged to emphasize how livable the floorplan is. This is one of the higher priced homes that Young's sells, so we wanted it to feel that way. Buyers are now comfortable enough in the home to sit down and enjoy the home, and interest in the home has increased dramatically. 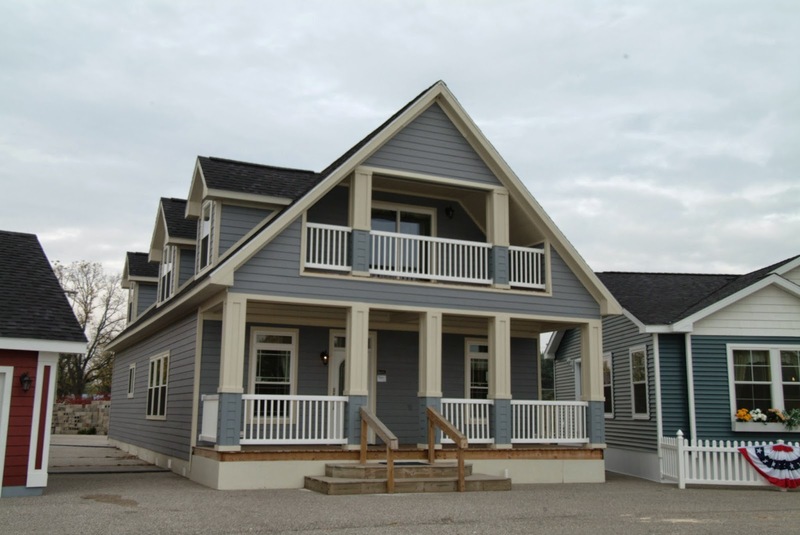 The Louisville Manufactured Housing Show is Back!